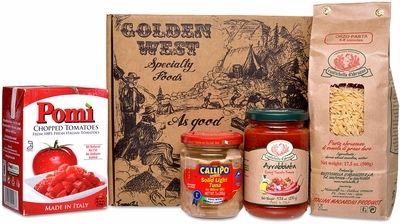 Enjoy the rich flavors of Italy with our custom made Taste of Italy Gourmet Gift Box. Each Gift Box comes with four unique an incredible Italian gourmet foods, encouraging the exploration of the Italian culinary landscape. Inside, you'll find the Rustichella Pasta, the Rustichella Pasta Sauce, the Calipo Tuna and the Pomi Tomatoes. Offer a gift of taste! Have us send them The Taste of Italy!